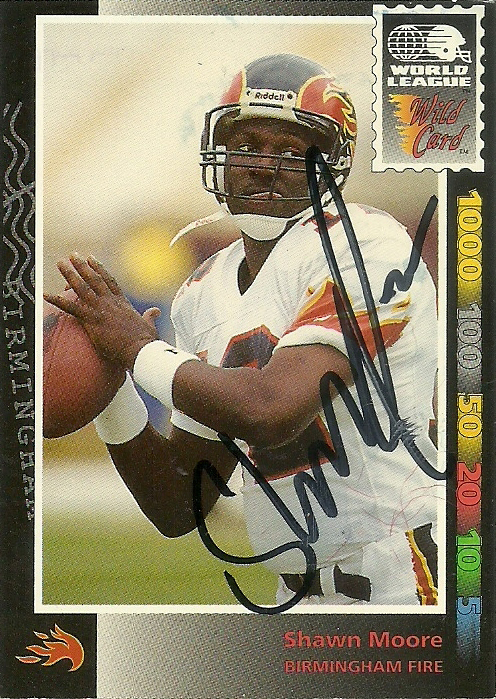 After the Birmingham Fire lost to the San Antonio Riders that humid night I tromped onto the field and got Shawn’s autograph on his Action Packed Rookies and Score 1991 card. You could see on his face the frustration of being buried on the depth chart and the relative annoyance he felt about being there, but he still managed to sign these two cards for me. In the early 90’s, Dan Reeves decided that he was going to pull rank and find the heir apparent to John Elway after tensions boiled to the surface between the two seasoned professionals. Dan drafted not one, but two quarterbacks in the 1991 draft. Highly regarded Tommy Maddox from UCLA and Shawn Moore from Virginia. Shawn had finished 1st in passing efficiency in the nation and broke most passing records for the Cavaliers in 1990. Moore would be drafted in the 11th round of the draft and back up both Maddox and Elway. 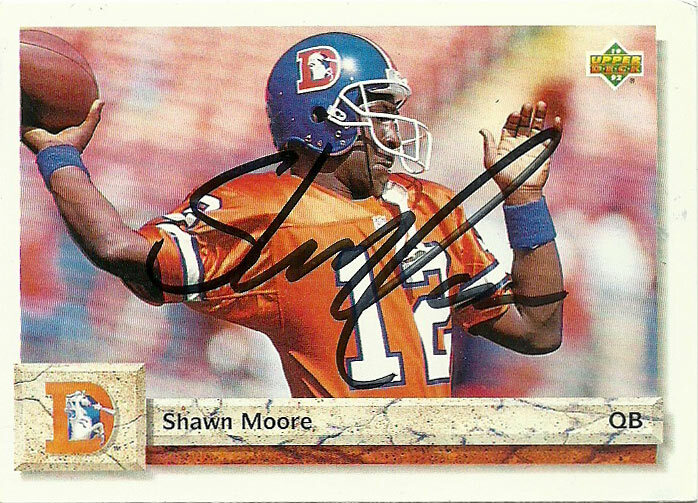 The Broncos would loan Moore to the Birmingham Fire for the 1992 season where he was expected to compete for the starting job, however he never saw any time off the bench sitting behind Mike Norseth. 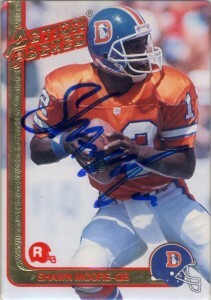 Shawn returned to the NFL for the 1992 season throwing for 232 yards and 3 picks in injury relief for John Elway. Afterwards he’d return to the bench of the Broncos, where he’d stay through 1993. 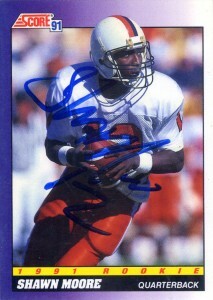 In 1994, Shawn signed with the Arizona Cardinals, but saw no playing time. He’d then head North to Canada for the 1995 season, splitting time with the Blue Bombers and Stampeders before retiring from professional football. Since then Moore has spent time in administration working as a national scout for the XFL and an enforcement representative for the NCAA. Currently he’s the wide receivers coach for his alma mater, The University of Virginia. I sent two cards out to Moore last year, hoping to get his autograph on two final cards but at this point am still waiting hopefully for a response.